Who, exactly, is Captain Marvel? Read on to find out! Carol Danvers has been the talk of the town lately, but her character has evolved since her debut in Marvel Comics in 1968. Throughout the decades Carol had a number of Super Hero identities and Earth-bound professions. But one thing that hasn't changed is her strength, complexity, and humanity. Below, find out about Carol's humble beginnings in Boston all the way to her cosmic journeys through the galaxy! Carol Danvers was born in Boston, Massachusetts to working-class parents, Joe and Marie, and had two brothers, Joe Jr. and Steve. It could be said that her feminist journey began even before she became a journalist at Woman magazine; citing his financial ability to send only one of his children to college, Carol's father decided on Steve despite Carol's superior grades. He also barked that Carol didn't have to go to college to find a husband. Her father, Joe, was the source of a lot of conflict, not just because of his antiquated attitude towards women, but the way he abused his two sons. When she turned 18 a few months later, Carol left her father behind and joined the Air Force in order to get her degree. Going by the call sign “Cheeseburger,” she quickly rose through the ranks. When Steve later died in military action, she reached out to her family again but never truly repaired their fractured relationship. It is during this stint as an Air Force pilot and then head of NASA security (the youngest in NASA history) that she meets the original Captain Marvel for the first time – her future love interest, mentor, and friend. Born in Boston to former U.S. Navy officer and construction worker Joe Danvers and undercover Kree champion Mari-Ell, Carol Danvers was originally named Car-Ell (“Champion” in Kree) but her parents changed it to “Carol” so she would fit in better on Earth. 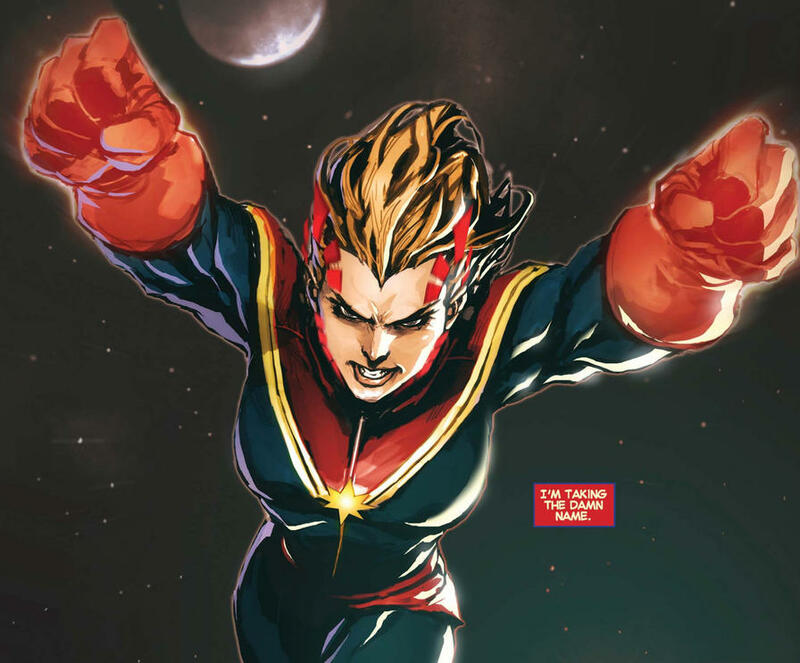 Carol was originally believed to have received her powers as Captain Marvel due to the explosion of a Kree Psyche-Magnitron in 1969’s CAPTAIN MARVEL #18. The incident involved a major confrontation with Kree Colonel Yon-Rogg, and the resulting blast of radiation coupled with the proximity of the Kree agent-turned-Super Hero Mar-Vell altered her genetic structure to become a human/Kree hybrid. 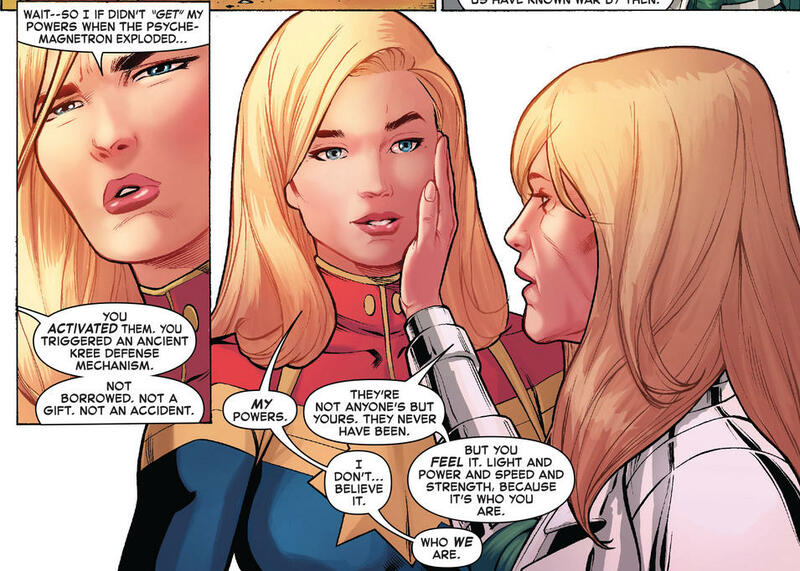 This was recently amended as of July 2018 in THE LIFE OF CAPTAIN MARVEL limited series by Margaret Stohl, wherein we find out that Carol’s mother was secretly a Kree the whole time and the radiation explosion actually just awakened her natural latent powers. She’s gone by many aliases—Binary, Ms. Marvel, Warbird, and Captain Marvel—and worked with many teams—the Avengers, the Defenders, the X-Men, the Guardians of the Galaxy, and more. Heck, Carol is even restless when it comes to her career options, having worked as an Air Force pilot, then at the CIA, NASA, and the Daily Bugle as a women’s magazine editor. Carol found herself on both sides of two different Civil Wars, and her greatest dream in HOUSE OF M—to be accepted, acknowledged, and adored by the public—made her very uncomfortable when it actually came to pass following CIVIL WAR II. So, why all the contradiction and confusion for a woman so strong and unwavering in her determination to protect the innocent? Well, the catalyst for her transformation—the Psyche-Magnitron—might be a clue. Carol has always struggled with duality, a lost sense of personal identity to varying degrees, and quite often even a substantial loss of memory to go along with it. Over the course of her decades-long run, Captain Marvel has manifested powers ranging from super strength, durability, stamina, flight, energy manipulation, and even precognition... but what people sometimes overlook is her healing factor. After the initial radiation blast that awakened her powers and launched her Super Hero career, Carol experienced some brain damage and lost time whenever she transformed into her then-persona of Ms. Marvel. Carol wasn’t even aware of this second personality until months (and about 18 issues) later. It wasn’t until she received treatments from the extra-dimensional Hecate and Ronan the Accuser (a Kree) that she was able to recover from her blackouts and piece her mind back together. Without the compartmentalization of an alter-ego personality, however, Carol seems to have struggled. She lost her memory several more times and sometimes turned to self-medication. It’s possible that Carol had a desire to forget. This recurrent memory wiping became almost a coping mechanism for her as she struggled to hide behind her career, her accomplishments, and her myriad godlike powers. But Carol’s healing factor has been compared to that of Deadpool and Wolverine, two heroes whose only means of “dying” is brain damage and thus a resultant loss of memory. Is it possible that Carol has had many such encounters? And is she actually seeking them out? These questions raise troubling implications for her state of mind and sense of identity—but even if she isn’t quite sure who she is, the world seems to know. Carol Danvers first took on the title of Ms. Marvel back in the ‘70s when using “Ms.” was a controversial stand in support of the feminist cause. She demanded equal pay, stood for her ethical ideals, and had honor in a world that was constantly trying to demean and defeat her. She’s gone through hell and back, dealing with her abusive father and then later surviving more than one incredibly traumatic mind control event. Each time she somehow found the strength to get back up again and do what she believed in: protecting Earth and its inhabitants. Carol feels as if she doesn’t know what she wants, but when she looks down on the big blue marble beneath her ship there is clarity—this is what she wants, this is who she is. She is a Captain, steering the ship of her home planet and with it her own destiny. 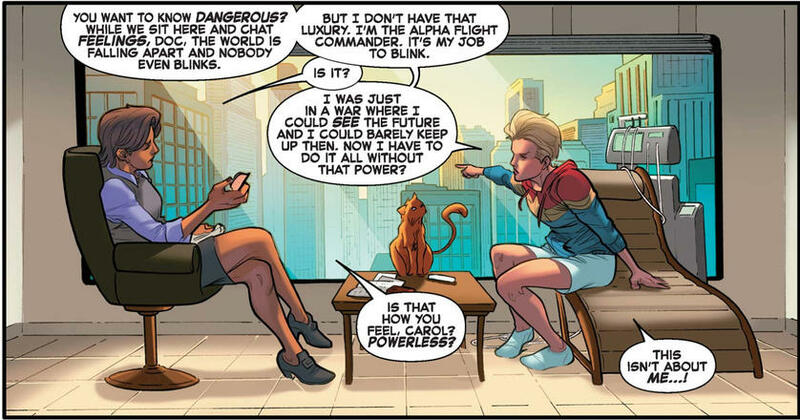 Carol Danvers has many astounding superpowers, but the greatest one of all is her spirit.